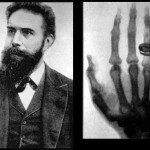 In 1895, Wilhelm Röntgen made an accidental discovery that forever changed the medical profession: X-Rays. He was the first to solve the puzzle of a peculiar device named the “Crookes Tube”, and ushered in a new field of research: Radiology. Decades later, Godfrey Hounsfield harnessed the power of the newly invented computer to create a new and powerful application to the (by then) old X-Rays: ‘Computed Tomography’, or CT. This technological adventure involved – surprisingly – one of the most famous bands of all time, the Beatles.